SEASIDE, OR. 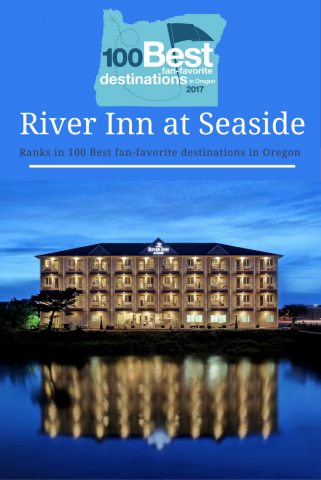 – December 7th, 2016 – River Inn at Seaside ranks in 100 Best fan-favorite destinations for Oregon. River Inn at Seaside was named #57 out of 100 Best fan-favorite destinations by Oregon Business Magazine. Destinations include hotels, restaurants, national parks, and other tourism destinations. Scores were determined by consumers- based on 22,000 reviews posted this year from Google, TripAdvisor, and Yelp. Reviews dated February thru September 2016 were taken into account to determine the rankings. “We’re excited to receive this recognition, knowing that we’re able to bring joy to our guests and provide a unique experience,” said Masud of Seaside Lodging. MEDIAmerica provided a luncheon celebration on December 7th, 2016 to announce the top 100 destinations and gave awards to the top 10. Seaside Lodging LLC is a hospitality company primarily engaged in the management and ownership of upper mid-scale to economy hotels. Established in 2009, the company currently owns and manages four properties all located in Seaside, OR.